One strand of Fiery Dragon Company’s work is the integration of church bells into the ensemble. This stems from a study Anne Gregson made into church bells as part of her Masters in Composition at Bath Spa University. The main form of bell ringing in the UK is known as change ringing and Anne found for a number of reasons that change ringing is unsuitable for integration into the ensemble. However in the course of the study she found out about a less well known form of bell ringing known as Ellacombe chimes. Instead of having someone for each bell pulling a rope to swing it and make it sound, these bells each have a rope attached to a hammer that strikes the bell. The ropes are fixed onto a frame on the wall and can be played by one person. 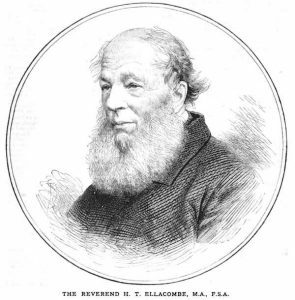 They are referred to as Ellacombe chimes because they were invented in the 19th Century by Reverend Henry Thomas Ellacombe who was the vicar at St Mary’s Church in Bitton from 1817 to 1850, a few miles west of Bath. 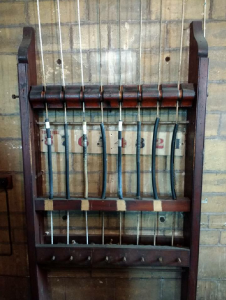 He wanted a way to control his unruly bellringers by having a system where one person alone could play the bells. For technical reasons the chimes are much less restricted in the ability to play melody than bells rung by a band of bellringers. Also since the bells do not swing when played this way they tend to be quieter than change rung bells. There are still many towers throughout the country which have the Ellacombe apparatus fitted and usable, including St Mary’s, Bitton where the original apparatus is still in place. The first performance of Anne’s music incorporating Ellacombe chimes took place in St Mary’s Church, Bitton in September 2016. In this performance the musicians played outside the church but there are only restricted circumstances in which this is possible (including a quiet location and good weather, both of which we were fortunate to have at Bitton). For the next performance at St John The Evangelist church in Bath in 2018 (a city centre church with rain forecast) we needed to bring the music inside the church. Church bells can be very quiet inside the church itself and so we placed a radio mic in the belfry which relayed the sound of the bells to a speaker in the church. Thus while the sound of the bells the audience heard was coming from a speaker it was in fact a live performance and of course all the other musicians were playing live as well. A live recording of one of the pieces played, Minimal Chimes, can be heard on the Home page of this website. For any concert or festival taking place in a church fitted with Ellacombe chimes Fiery Dragon Company can provide an interesting, musically effective and totally unique performance of music incorporating church bells.